An online teaching degree allows you to make a major positive impact on the lives of children and teenagers. You help students gain new insights and become more interested in subjects. You also encourage their creativity and help them maximize their talents. You have the privilege of inspiring and motivating young people. You have an opportunity to share your passion of specific subjects. Who is responsible for Accreditation? What are some alternative teaching certifications options? What are the different kinds of graduate Teaching degrees? What are teaching job options, salaries, and job outlooks? Are there any loan forgiveness plans for teachers? See also: What can I do with an Education degree? We selected the schools providing online education programs based on the quality of the programs, the types of courses offered, the faculty, rankings, awards, and reputation, including the school's reputation for effectively providing quality online teaching degree programs. Michigan State University ranks #1 on The Best Online Teaching Degrees! Michigan State University (MSU) established its College of Education in 1952, but began offering education courses 50 years earlier. MSU's College of Education focuses on improving learning and teaching across the U.S. and around the world, especially within the contexts of global and urban education as evidenced in the Urban Educators Cohort Program and the Global Educators Cohort Program. The National Academy of Education and lead organizations, such as the American Educational Research Association have inducted the college's renowned faculty. The college's curriculum promotes education policy reform and prepares graduates to help its implementation. It also forms connections between practice and theory through partnership with communities and schools. All students must complete a full academic-year internship before receiving teacher certification. The college's faculty and students also conduct rigorous, comprehensive research which addresses the problems and needs of practice. The College offers the W.K. Kellogg Foundation Woodrow Wilson Michigan Teaching Fellowship and is home to a host of research centers, such as the Literacy Achievement Research Center, the National Center for Research on Teacher Learning, the National Center for Research on Teacher Education, CREATE for STEM Institute, and the Confucius Institute at MSU. Doctoral students can participate in the Fellowship to Enhance Global Understanding, a faculty-led international study trip. Several of its programs feature fully online or hybrid options, and the college offers an accelerated plan for undergraduate students who hold 56 credits. The university is accredited by the Higher Learning Commission of the North Central Association of Colleges and Schools. The College of Education is also accredited by the Teacher Education Accreditation Council. University of Indiana Bloomington ranks #2 on The Best Online Teaching Degrees! The University of Indiana Bloomington has a long history of teacher education – offering its first teaching course in 1852. Founded in 1908, the University of Indiana Bloomington School of Education prepares graduates for careers skilled educators. The school strives to improve learning, teaching, and human development in a diverse, global, rapidly changing and technological society. It also informs educational practice and theory through research and works in partnership with constituents to effect change throughout the world. The School of Education is composed of five academic departments – Curriculum and Instruction; Counseling and Educational Psychology; Educational Leadership and Policy Studies; Instructional Systems Technology; and Literacy, Culture and Language Education. The University of Indiana Bloomington is home to a dozen institutes and centers, such as the International Center for Home Education Research, the Project on Academic Success, and the Urban Center for the Advancement of STEM Education. The UI Bloomington School of Education helps build stronger communities through a number of outreach and collaboration experiences, such as Global Gateway for Teachers; Make, Innovate, Learn Lab (MILL), the Saturday Science Quest for Kids, and iRubric. It also features cultural immersion programs, which allow students to teach in urban communities. The University of Indiana Bloomington is accredited by the National Council for Accreditation of Teacher Education and the North Central Commission on Institutions of Higher Education. The university also is a member of the American Association of Colleges for Teacher Education. University of Georgia ranks #3 on The Best Online Teaching Degrees! The University of Georgia's College of Education, founded in 1908, enrolls more than 4,500 students. One of the most comprehensive and largest schools of education in the country, the College of Education offers more than a dozen undergraduate majors and about 90 graduate programs leading to a host of careers such as administrators, psychologists, counselors, educators and more. The college strives to be a center for innovative research, service projects and teaching, and to contribute to a healthy, just, well-educated and equitable society. The college engages in research which advances human development, education, policy, and health. The faculty and curriculum also provide cutting-edge ideas to the next generation of scholars, leaders, and practitioners in the fields of teaching, learning, and individual development. The college is home to a number of research centers, such as the Torrance Center for Creativity and Talent Development, the Georgia Center for Assessment, the Center for Physical Activity and Health, the Center for Latino Achievement and Success in Education, and the Center for Autism and Behavioral Education Research. The college enriches students' learning experiences through a host of research labs, including those in Athletic Training, Biomechanics, Cognitive-Communication Rehabilitation, Cognition and Skill Acquisition, and more. The University of Georgia is accredited by the Southern Association of Colleges and Schools Commission on Colleges. Its College of Education also is accredited by the National Council on Teacher Education, the Georgia Professional Standards Commission and the Council for the Accreditation of Educator Preparation. Arizona State University ranks #4 on The Best Online Teaching Degrees! Arizona State University has a long history of teacher education with its beginnings as a normal school in 1885. Its Mary Lou Fulton Teachers College, founded in 2010, continues the tradition through preparing graduates for successful careers as educators, school principals, scholars and policymakers. The college integrates experiential learning and use-inspired research, and engages students and faculty in programs which combine data gathering from the field with clinical training. Faculty draws from a range of academic disciplines such as psychology, cognitive science, and sociology to gain insight on learning styles, scientific policies, and more. The Fulton Teachers College consists of two academic divisions – the Division of Teacher Preparation, which provides students with the skills, knowledge, and competencies to positively impact children, schools, youths and communities; and the Division of Educational Leadership and Innovation, which prepares graduates for careers at full-time faculty at research institutions and advanced teacher preparation. In 2016, the college's Center for Advanced Studies in Global Education hosted the inaugural symposium of the Comparative and International Education Society – in partnership with edXchange. The college features several centers, including the Center for the Art and Science of Teaching, the Center for Advanced Studies in Global Education, the Sanford Inspire Program, and the edXchange. The college also is home to the Mary Lou Fulton Teachers College Preschool and the Gary K. Herberger Young Scholars Academy. Arizona State University is accredited by the Higher Learning Commission of the North Central Association of Schools and Colleges. Florida State University ranks #5 on The Best Online Teaching Degrees! Established in 1905, Florida State University's College of Education is the oldest college of education in the state of Florida. The college features challenging, innovative programs and unique teaching methodologies. The college allows students to engage in leading educational research and technology. The College of Education prepares graduates to meet the challenges of an ever-changing field, and explore new teaching methods and advances in educational technology. The College of Education designed its education courses with a theory-to-practice outcome. Students can engage in industry-leading research in teacher preparation, educational techniques, scientific inquiry, educational policy, sport management, and more. Florida State University (FSU) features six issue-focused research centers, such as FSU-Teach, the Learning Systems Institute, the Human Services Center, and the Adult Learning Evaluation Center. Florida State University is accredited by the Southern Association of Colleges and Schools Commission on Colleges and National Council for Accreditation of Teacher Education. University of Florida ranks #6 on The Best Online Teaching Degrees! The University of Florida's College of Education offered its first education classes in 1906. The college enrolls about 1,400 students through more than two dozen degree and academic programs. The college is composed of the following schools – the School of Teaching and Learning; the School of Special Education, School Psychology & Early Childhood Studies; and the School of Human Development and Organizational Studies in Education. Designed to enhance school improvement, teacher retention, and student achievement, the college is home to a number of centers, such as the Anita Zucker Center for Excellence in Early Childhood Studies, the Institute of Higher Education, the National Center to Inform Policy and Practice in Special Education Professional Development, and the Lastinger Center for Learning. The centers highlight the college's partnerships with school districts, public schools and communities. Nationally recognized faculty teach the courses, focusing on human behavior, cutting-edge research and more. The University of Florida is accredited by the Southern Association of Colleges and Schools Commission on Colleges and the National Council for Accreditation of Teacher Education. University of Illinois – Urbana Champaign ranks #7 on The Best Online Teaching Degrees! Founded in 1905, University of Illinois – Urbana Champaign, College of Education at Illinois is renowned for preparing leaders in the field of education, groundbreaking research and a worldwide impact. The land-grant school of education advances knowledge and impacts policy through teaching, research, and outreach. The college contributes to making education accessible and equitable to all learners; prepares researchers, leaders, and advocates committed to helping learners of all ages; and develops innovative methods and tools. The Bureau of Educational Research supports interdisciplinary or interdepartmental collaboration thereby enriching the research culture for students and faculty. The college is home to several research centers, such as the Center for Culturally Responsive Evaluation & Assessment, the Center for Education in Small Urban Communities, and the National Institute for Learning Outcomes Assessment. The college established the Youth Literature Festival, which celebrates the value of reading in youth's lives. The University of Illinois – Urbana Champaign is accredited by the North Central Association of Colleges and Schools. Pennsylvania State University ranks #8 on The Best Online Teaching Degrees! Founded in 1923, Pennsylvania State University's College of Education enrolls about 3,300 students in a variety of undergraduate, graduate and online programs. The college's curriculum provides students with a solid foundation as well as a number of study abroad and international student-teaching opportunities. The College of Education embraces technology as a powerful educational tool and conducts online tutoring outreach to urban schools. The college's faculty includes 19 Fulbright scholars. The college receives millions of dollars annually to conduct ground-breaking, leading-edge research. Penn State's award-winning Professional Development School builds on a partnership with the State College Area School District and features a full-school-year student teaching experience. The college also participates in outreach through the Center for Science and the Schools, diversity programs for high school studies, and LifeLink PSU, an enrichment program with the local school district. The College of Education also is home to a number of research initiatives, such as the Center for the Study of Higher Education, Adult and Family Literacy, the Krause Innovation Studio, and the Institute for Research in Training & Development, as well as special programs, including the Hubert H. Humphrey Fellowship Program, the American Indian Leadership Program, and Joint Degree Programs in Law and Education Policy Studies. Pennsylvania State University – University Park is accredited by the National Council for Accreditation of Teacher Education and the Middle States Commission on Higher Education. University of Southern California ranks #9 on The Best Online Teaching Degrees! The University of Southern California began offering education classes in the 1890s and established its School of Education in 1918. The Rossier School of Education enrolls about 2,000 students on campus and online. The school's curriculum provides students with the skills they need to make a significant difference in the lives of their students. The Rossier School of Education prepares students to apply evidence-based theories and principles of motivation, learning, and cultural competence and to develop skills to negotiate barriers to learning. The school supports forward-thinking researchers and scholars whose work reflects a diversity of experience and perspectives. The curriculum incorporates cutting-edge technology and collaborative, innovative solutions to improve education outcomes. Faculty performs cutting-edge research in five areas – Economics and Finance; Governance and Accountability; Organizational Leadership; Politics and Public Policy; and Learning and Motivation. The college's research centers include the Center for Human-Applied Reasoning and the Internet of Things; the Center for Enrollment Research, Policy and Practice; and the Center for Urban Education. The same USC faculty teach the college's online and on-campus programs. The University of Southern California is accredited by the Western Association of Schools and Colleges and NCATE. University of Kansas ranks #10 on The Best Online Teaching Degrees! Founded in 1909, the University of Kansas' School of Education prepares graduates for careers as teachers, counselors, administrators, health and sport professionals, and psychologists. The school is home to a host of research and service organizations, such as the Center for Research on Learning, the Center for Psychoeducational Services, the Life Span Institute, and the Beach Center on Disability. The curriculum expands and deepens students' understanding of education as a fundamental human endeavor, and helps society respond to and define its educational challenges and responsibilities. The school's online teaching degrees allow students to apply what they're learning whether in the classroom or a consultative setting. The same nationally recognized faculty teach the school's online and on-campus courses. The University of Kansas is accredited by the Higher Learning Commission and the NCATE. University of Iowa ranks #11 on The Best Online Teaching Degrees! The University of Iowa, College of Education, founded in 1847, has a long history of excellence and service. Its world-renowned faculty prepares graduates for careers in educational administration, psychology, teaching, and student development, among others. The College of Education helps students build knowledge and practice to address societal changes and develop the competencies and practices needed to address complex social and educational issues. The College of Education is home to a number of research centers, such as the Belin-Blank International Center for Gifted Education and Talent Development, the Center for Advanced Studies in Measurement and Assessment, the Iowa Reading Research Center, and the Iowa Center for Assistive Technology Education and Research. The University of Iowa is accredited by the Higher Learning Commission. University of Nebraska-Lincoln ranks #12 on The Best Online Teaching Degrees! The University of Nebraska-Lincoln's College of Education and Human Sciences, established in 1908, features a multidisciplinary approach which integrates learning and teaching, scholarship, research, outreach and service. The college is dedicated to enhancing the lives of – and strengthening the relationships among -- people, families, communities and schools. With a variety of options, the College of Education prepares graduates to work in early childhood settings with young children, especially those in military installations; as educational leaders; as teachers of deaf or hard of hearing students; and more. The curriculum helps students develop processes, principles, and skills needed for effective leadership. The university is home to the Ruth Staples Child Development Lab, one of the oldest university laboratory schools in the nation; the Nebraska Center for Research on Children, Youth, Families and Schools; the Early Development and Learning Lab; the National Center for Research on Rural Education, funded by the U.S. Department of Education's Institute of Education Sciences; and the Center for Instructional Innovation. Established to make the university's resources available to education institutions, agencies and organizations of Nebraska, the Bureau of Educational Research and Field Services conducts and disseminates educational field studies and research. University of Nebraska-Lincoln is accredited by the Council for Accreditation of Educator Preparation and the Higher Learning Commission. University of Pittsburgh ranks #13 on The Best Online Teaching Degrees! The University of Pittsburgh, School of Education, founded in 1910, is an international leader in the education field. Dedicated to preparing graduates for life-changing careers as a health educators, teachers, public policy experts, researchers, or administrators, the school enrolls approximately 1,200 students. The school's focus includes improving the educational experience for children in urban schools, exploring the synergy between classroom practice and public policy, understanding strategies and factors that lead to classroom success, and developing obesity prevention programs. The school's online courses, designed for working professionals, feature peer discussion sessions, instructor interaction, and projects and assignments that promote critical thinking. The School of Education houses a number of research centers, such as the Learning Research & Development Center, the Learning Policy Center, the Center for Urban Education, and the Office of Child Development. Education students gain hands-on experience through the Fanny Edel Falk Elementary, a kindergarten to eighth-grade tuition-based campus laboratory school affiliated with the School of Education. The University of Pittsburgh is accredited by the Middle States Association of Colleges and Schools Commission on Higher Education. University of Missouri ranks #14 on The Best Online Teaching Degrees! Founded in 1867, the University of Missouri's College of Education enrolls approximately 2,700. The college consists of the Department of Learning, Teaching & Curriculum, Department of Educational, School & Counseling Psychology, the Department of Educational Leadership & Policy Analysis, the School of Information Science & Learning Technologies, and the Department of Special Education. Mizzou Ed values equity, inclusiveness, and diversity and offers a number of diversity-related initiatives, activities, and programs. These include The Bridge, a Diversity Committee, and the Office of International and Intercultural Initiatives. The University of Missouri Center for Schoolwide Positive Behavior Support works with programs worldwide to provide schools and educators with research-based tools and information. The College of Education also is home to the ReSTEM Institute and the Hook Center for Educational Leadership and District Renewal. The University of Missouri is accredited by the Higher Learning Commission and the Council for Accreditation of Educator Preparation. University of South Carolina ranks #15 on The Best Online Teaching Degrees! The University of South Carolina's College of Education is a leader in comprehensive preparation for counselors, teachers, education administrators, researchers, policymakers, and athletic trainers. The College of Education emphasizes the construction and application of skills and knowledge to promote educational equity, excellence and opportunity. The college bridges the gap among research, theory, and practice to promote excellence in learning and teaching. Divided into four academic departments – Educational Leadership and Policies, Educational Studies, Physical Education and Athletic Training, and Instruction and Teacher Education – the College of Education focuses on educational leadership in public and private sectors, educational psychology and research, special education, professional development of teachers, and physical education. The College's award-winning faculty members have received millions of dollars in grants and awards funding. The college's faculty and students engage in a variety of research endeavors. The college's research centers include the Office of International and Comparative Education, the South Carolina Educational Policy Center, and the Yvonne and Schuyler Moore Child Development Research Center. The University of South Carolina is accredited by the National Council on Accreditation of Teacher Education and the Southern Association of Colleges and Schools Commission on Colleges. Its programs also are recognized by the American Council on the Teachers of Foreign Languages, the National Science Teachers Association, and the National Association of Education of Young Children, among others. George Washington University ranks #16 on The Best Online Teaching Degrees! George Washington University founded its Graduate School of Education and Human Development in 1909, although teacher education at the university began five years earlier. Comprised of five academic departments, the Graduate School of Education enrolls more than 1,400 students. The school features an innovative curriculum which prepares graduates for leadership roles, advocacy, and careers as effective educators. Its academic departments include Curriculum and Pedagogy, Educational Leadership, Human and Organizational Learning, and Special Education and Disability Studies. The school advances knowledge through meaningful research, which is timely, relevant and contributes to social progress through education. The school's research centers include the Center for Advancement of Research in Distance Learning, the Center on Education Policy, the Mayberg Center for Jewish Education and Leadership, and the Center for Rehabilitation Counseling Research and Education. George Washington University is accredited by the Middle States Association of Colleges and Schools and NCATE. Purdue University West Lafayette ranks #17 on The Best Online Teaching Degrees! Established in 1907, Purdue University West Lafayette's College of Education has a long history of preparing teachers who understand how students learn and have skills to help students succeed. Through scholarship, teacher preparation, and research, the College of Education works to effect positive change and transform the lives of learners of all abilities and ages. Purdue University West Lafayette is home to a host of research centers and institutes, including the James F. Ackerman Center for Democratic Citizenship, the Center for Advancing the Teaching and Learning of STEM, the Gifted Education Resource Institute, and the Evaluation and Learning Research Center. World-renowned faculty leads the university's rigorous academic programs – including those with a flexible online schedule. Council for the Accreditation of Educator Preparation (CAEP). George Mason University ranks #18 on The Best Online Teaching Degrees! The largest and most comprehensive graduate school of education in Virginia, George Mason University's Graduate School of Education is a nationally recognized leader in special education, educator preparation, counseling, and school leadership. The Graduate School of Education offers innovative academic programs, which include instructional design and technology, and advanced study for school leaders and teachers. The school promotes learning and development across the lifespan. The College advances knowledge through 11 research centers, including the Center for International Education, the Center for Restructuring Education in Science and Technology, the Center for Outreach in Mathematics Professional Learning & Educational Technology, and the Center for Education Policy and Evaluation. George Mason University is accredited by the Commission on Colleges of the Southern Association of Colleges and Schools and NCATE. North Carolina State University ranks #19 on The Best Online Teaching Degrees! North Carolina State University's College of Education has a dedication to the advancement of research, educational success and achieving high goals for the development of professionals. The College of Education's practice and inquiry reflect integrity, the value of diversity, and a commitment to social justice. Composed of three departments – Educational Leadership, Policy and Human Development; Science, Technology, Engineering and Mathematics Education; and Teacher Education and Learning Sciences – the college emphasizes real-world experience through engagement activities and research opportunities. Award-winning faculty members prepare students for a host of careers. The university's William & Ida Friday Institute for Educational Innovation advances education through innovation in learning, teaching, and leadership. The institute provides professional development programs, conducts research, and develops educational resources. The school offers nearly two dozen online Master's programs in Education, providing students flexibility to earn their degree. North Carolina State University is accredited by the Southern Association of Colleges and Schools Commission on Colleges and NCATE. State University of New York at Albany SUNY ranks #20 on The Best Online Teaching Degrees! Established in 1844, the State University of New York at Albany's School of Education provides evidence-based strategies for teachers, principals and school district leaders. A leader in higher education and teacher preparation in the state, the school focuses on technology-based learning and teaching, the development of literacy throughout the lifespan, teacher leadership, and strategies to foster human development and mental health. The School of Education enrolls more than 4,000 students. Its renowned research faculty members explore change in learning and teaching, international educational policy, literacy, mental health counseling, educational technology, and human development. The School of Education strives to enhance learning and human development, produce rigorous scholars, and prepare professionals for schools, communities and higher education. SUNY Albany's School of Education receives millions of dollars in funding for its 15 research centers and institutes, including the Center for the Elimination of Minority Health Disparities, the Child Research and Study Center, the Educational Evaluation and Research Consortium, and the Pathways Into Education Center. The University at Albany is accredited by the Middle States Commission on Higher Education and the Teacher Education Accreditation Council (TEAC). Kansas State University ranks #21 on The Best Online Teaching Degrees! Kansas State University's College of Education is the largest teacher preparation program in the state of Kansas. The College of Education is home to a dozen research centers and organizations, such as the Center for Rural Education and Small Schools, the Council for Public School Improvement, the Center for Social Studies Education, and the Office of Innovation and Collaboration. The university hosts a Professional Development Schools partnership program, which allows students to participate in clinical experiences. The college's curriculum combines teaching techniques with technology, designed to challenge and inspire students to engage in lifelong learning. Students also can receive short-term intensive learning experiences through the Kansas State University Global Teacher partnerships. Kansas State University is accredited by the Higher Learning Commission and NCATE. University of North Carolina at Charlotte ranks #22 on The Best Online Teaching Degrees! The UNC Charlotte Cato College of Education prepares counselors, school leaders, and teachers who meet the needs of all students and provide youth with access to a quality education. The Cato College of Education also provides graduates with skills to have a positive impact on youth, families, schools and communities. The college enrolls more than 2,300 students. Award-winning faculty perform cutting-edge research related to struggling readers, autism, students with disabilities, the teacher shortage, and more. The college houses research centers and institutes, including the Center for Educational Measurement and Evaluation, the Multicultural Play Therapy Center, the Urban Education Collaborative, and the Center for Science, Technology, Engineering & Mathematics Education. The UNC Charlotte Cato College of Education offers a host of programs, ranging from undergraduate majors and minors to doctoral programs, and nine online master's degree programs, which students can complete in about two years. University of North Carolina at Charlotte is accredited by the Southern Association of Colleges and Schools and NCATE. Ball State University ranks #23 on The Best Online Teaching Degrees! Founded in 1918, Ball State University has a long history of training teachers. Its Teachers College provides students with rigorous classroom instruction and experiential learning. The college boasts one of the largest graduate enrollments in the nation and three distinguished faculty in educational psychology and special education. The Teachers College is home to nine research centers and community outreach clinics, such as the Center for Autism Spectrum Disorder, the Alliance for Community-Engaged Teacher Preparation, the Center for Gifted Studies & Talent Development, and the Center for Economic Education, among others. The college's faculty also co-edits The Teacher Educator, a prestigious journal. Through a number of online Education Master's programs, the Teachers College allows students to earn degrees on their schedule. Ball State University is accredited by the Higher Learning Commission, NCATE, and the Council for the Accreditation of Educator Preparation. State University of New York at Buffalo SUNY ranks #24 on The Best Online Teaching Degrees! Founded in 1931, the University at Buffalo's Graduate School of Education creates and applies knowledge informed by research on educational policy, human development, information sciences, and pedagogy. The curriculum emphasizes evidence-based practice and prepares graduates to meet challenges of the 21st Century. The school boasts more than 18,000 alumni worldwide. Composed of four departments – Counseling, School, and Educational Psychology; Educational Leadership and Policy; Library and Information Studies; and Learning and Instruction – the Graduate School of Education prepares graduates for a variety of career options. UB's award-winning faculty members secure millions of dollars in grants to further their research. UB is home to a number of centers and special projects, including the Center for Continuing and Professional Education, the Early Childhood Research Center, the Gifted Math Program, the Alberti Center for Bullying Abuse Prevention, and the Teacher Education Institute. The university's City Voices, City Visions program teaches secondary school educators to integrate video composing into their curriculum. The State University of New York at Buffalo is accredited by the Middle States Commission on Higher Education, the Teacher Education Accreditation Council and the Council on Rehabilitation Education. University of Houston ranks #25 on The Best Online Teaching Degrees! The University of Houston's College of Education trains teachers, counselors, principals, health educators and academic leaders through a combination of research and real-world experience. The College of Education works to eradicate inequities in health and education to transform communities. The College of Education includes three departments – Educational Leadership and Policy Studies; Psychological, Health and Learning Sciences; and Curriculum and Instruction. Depending on their career goals and personal interests, students can focus on early childhood to eighth-grade, Asian American studies, counseling psychology, higher education, and more. The University of Houston is home to a number of institutes and research centers, including the All Kids Alliance, the Consistency Management & Cooperative Discipline program, the Center for Research, Evaluation and Advancement of Teacher Education, and the Institute for Urban Education. The University of Houston is accredited by the Commission on Colleges of the Southern Association of Colleges and Schools and NCATE. University of Dayton ranks #26 on The Best Online Teaching Degrees! The University of Dayton's School of Education and Health Sciences combines critical reflection with a learning community focused on educational theory and practice. The School, which excels at early childhood and urban education, prepares future leaders and teachers to succeed in diverse settings, and helps teachers grow professionally and meet challenges – all with the Catholic, Marianist educational philosophy. The curriculum fosters both integration and specialization and prepares graduates to use the highest quality of leadership, learning and scholarship to build strong learning communities. Through real-world experiences, the School of Education and Health Sciences prepares graduates for careers as administrators, teachers, school psychologists, counselors, human service practitioners, and more. The school provides students with access to research, hands-on training and leading-edge technology through partnerships, offices and centers, including the Urban Teacher Academy, the Lalanne Program, the Bombeck Family Learning Center, and the Dayton Early College Academy. The University of Dayton is a member of the Teachers for a New Era Learning Network, supported by the Annenberg Foundation and the Carnegie Corporation of New York. The university's community outreach initiatives include the Center for Catholic Education, the Center for Early Learning, and the Dayton Early College Academy. Early Childhood Leadership & Advocacy, B.S.E. Early Childhood Leadership and Advocacy, M.S.E. Transdisciplinary Early Childhood Education, M.S.E. Educational Leadership with a Catholic School Leadership Concentration, M.S.E. Educational Leadership with a Leadership for Educational Systems Concentration, M.S.E. The University of Dayton is accredited by the North Central Association, the Council for the Accreditation of Educator Preparation and the National Council for Accreditation of Teacher Education. University of Cincinnati ranks #27 on The Best Online Teaching Degrees! The University of Cincinnati College of Education, Criminal Justice and Human Services consists of three schools, including the School of Education. The School of Education is the largest of the schools with about 2,300 students enrolled. The School of Education offers an array of degree programs, including bachelor, master and doctoral degrees. The curriculum prepares educators committed to social justice issues and competent in data-driven decisions and evidence-based practice. Students gain real-world knowledge through extensive field-clinical experiences. The school is home to six research centers: The Center for English as a Second Language, the Action Research Center, the Arlitt Preschool Center, the Developmental & Learning Sciences Research Center, the Center for Studies in Jewish Education & Culture, and the Literacy Research and Innovation Center. School of Education faculty conduct research in curriculum studies, early childhood education, K-12 education, educational studies, literacy and ESL, special education, and instructional design and technology. The University of Cincinnati is accredited by the Higher Learning Commission, the Accreditation Council for Cooperative Education, and the National Council for Accreditation of Teacher Education. 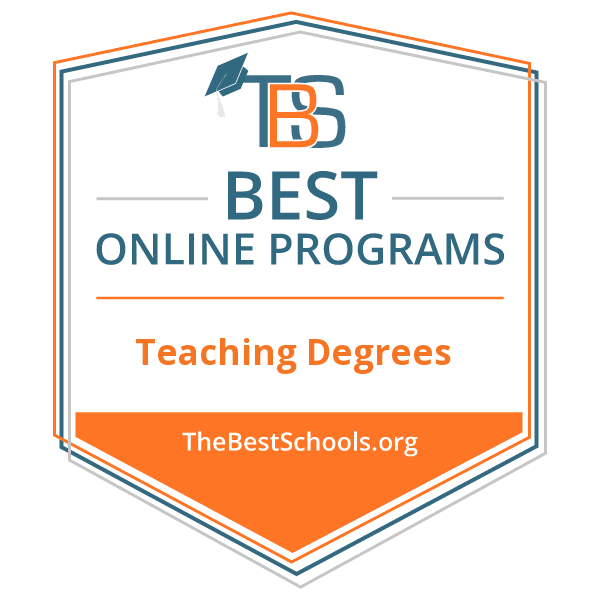 Auburn University ranks #28 on The Best Online Teaching Degrees! Auburn University's College of Education strives to prepare agents of change and to work with socially responsive learning communities. The College of Education identifies and addresses critical issues related to education and uses technology to support and broaden learning opportunities. The College of Education focuses on ethics and dignity, collaboration and public engagement, and diversity. The college's curriculum prepares human service providers and teachers to work with culturally diverse learners and to foster a climate of open dialogue and respect. The College of Education consists of the following departments – the Department of Curriculum and Teaching, the Department of Educational Foundations, Leadership and Technology; and the Department of Special Education, Rehabilitation and Counseling – and the School of Kinesiology. Many academic programs combine coursework and clinical experience. Auburn University is home to a number of centers and institutes, such as the Auburn Center for Evaluation, the Center for Disability Research and Policy Studies, the Warrior Research Center, and the Truman Pierce Institute. Auburn University is accredited by the Southern Association of Colleges and Schools and NCATE. University of South Florida ranks #29 on The Best Online Teaching Degrees! The University of South Florida's College of Education, founded in 1959, promotes social justice and transformative education through innovative teaching, rigorous research and locally and globally engaged partnerships. A leader in education, USF College of Education strives for academic excellence, collaboration which serves people and communities, and preparation which builds on scholarship, clinical practice and academic excellence. USF College of Education features global engagement through conference presentations, partnerships, study abroad trips, and visits to international university. The College of Education is home to eight centers and institutes, including the Institute for School Reform, the Center for Migrant Education, and the Advanced Placement Summer Institute. Students can pursue a number of USF College of Education's degree programs online. Some do require clinical experiences, practica or internships. The University of South Florida is accredited by the Commission on Colleges of the Southern Association of Colleges and Schools and the National Council for Accreditation of Teacher Education. University of North Carolina Greensboro ranks #30 on The Best Online Teaching Degrees! The University of North Carolina at Greensboro (UNCG) has a long history of teacher education, having begun as a normal school in 1891. The School of Education combines practical learning experiences and rigorous coursework. Through field placements, internships, community-engaged scholarship, and practicum, students and faculty work collaboratively toward solutions for a more equitable society. The School of Education also provides hands-on experience through on-campus centers, such as the SELF Design Studio, the Coalition for Diverse Language Communities, and the Office of Assessment, Evaluation, and Research Services, among many others. The School of Education's Collaborative for Educator Preparation oversees practices and policies of the university's professional education programs, and its Council of Program Coordinators ensures and coordinates the quality of existing licensure programs. The University of North Carolina at Greensboro is accredited by the Southern Association of Colleges and Schools Commission on Colleges and the National Council for Accreditation of Teacher Education. In order to teach in a public elementary or secondary school in the United Sates, an individual must obtain a teaching certificate. Some private schools also require a teaching certificate. The Board of Education of each individual state controls the certification process, the certification requirements may vary, however, all states require aspiring teachers obtain a bachelor's degree. Many prospective teachers obtain a Bachelor of Science in Education degree. These programs typically include study in an academic subject such as English, history, math, or a science, and they provide teaching skills. Some prospective teachers choose an alternative route consisting of a bachelor's degree in an academic subject, plus supplementary coursework in pedagogy. All states require classroom experience or student teaching. In addition, some states require aspiring teachers to pass a special examination. Some states have alternative teaching certification programs for people who don't have Education degrees. There are also alternative certifications for those interested in career and technical education. The Council for the Accreditation of Educator Preparation (CAEP) serves as an accreditation organization for teacher education programs in the United States. CAEP became established in 2013 through the consolidation of the National Council for Accreditation of Teacher Education (NCATE) and the Teacher Education Accreditation Council (TEAC). CAEP has received recognition from the Council for Higher Education (CHEA), the nation's largest institutional higher education membership organization. CHEA serves as a primary national advocate for accreditation and quality assurance to the U.S. Department of Education and the U.S. Congress. Every state requires teachers to have at least a bachelor's degree but they're not required to have a Bachelor in Education Degree. States have alternative certification programs for individuals with a bachelor's degree in a subject other than education. Individuals basically have two types of these certification programs to choose from: Programs provided through the state and programs provided through independent agencies. Many states do not provide specific types of teaching certificates to alternative pathway candidates, for example, special education. Some states only allow alternative pathway teachers to teach in shortage areas or at specific grade levels, often secondary grades. Since alternative pathway teachers already have a bachelor's degree many programs also provide students a master's degree while they're qualifying students for teacher licensure. Many teachers who select the alternative certification path go on and acquire a master's degree. Students can typically complete a Master's degree program in two years. Private school teachers: Teachers at private schools are not required to meet the state requirements for public school teachers. However, private high schools usually prefer teachers with a bachelor's degree and a major in a subject area. Private schools usually prefer kindergarten and elementary school teachers with a bachelor's degree in elementary education and middle school teachers with a bachelor's degree and a major in elementary education or a content area. Teachers at private schools usually don't need to have a license. Career and technical education also known as CTE covers a wide array of subjects such as information technology, agriculture, business and health sciences. Many states provide options which allow prospective CTE teachers to substitute previous experience and education for the typical requirements for a bachelor's degree. The most commonly used guidelines for prospective career and technical education teachers allow individuals with sufficient knowledge and experience in their subject to teach full-time under a provisional certificate while an experienced teacher mentors them. Individuals on this path often need to complete a professional development plan which includes supplemental coursework in teaching strategies and standards. Individuals who complete these requirements along with testing requirements from their state, may advance from a provisional teaching certificate to a basic teaching certificate. Master of Education (M.Ed.) degree programs attract individuals with an interest in specialty training in the educational field or in a leadership position, such as a school principal or an educational administrator. M.Ed. programs meet the academic and professional interests of professionals in the education field. Some M.Ed. programs cater to educators who already have a teaching license and some cater to individuals seek employment in the education field but outside of a traditional classroom. Some programs provide M.Ed. degrees to individuals without teaching experience. Master of Education programs typically cover the strategic and theoretical aspects of education and subjects related to human psychology and behavior which apply to the science of education and instruction. They cover instructional and professional subjects applicable to school and student performance. Graduates can use the degree to advance their career as an educator. Graduates of M.Ed. programs can use the skills they've learned in a wide variety of industries. Students in Master of Education programs typically need to gain practical experience in a formal or informal applicable education setting through student teaching, a fellowship, internship of formal observation hours. Master of Arts in Teaching (MAT) degree programs attract current and prospective K-12 teachers who seek additional certification to advance in their careers or seek their initial teaching license. MAT degree programs attract individuals interested in gaining or improving teaching methods, improving their teaching style and classroom performance and enhancing their expertise in a specific content area. Master of Arts in Teaching programs have a focus on the act of teaching as well as the practical skills and knowledge teachers use to teach groups and individual students. MAT degree programs examine education theories, methods, philosophies, concepts and styles and develop skills in areas such as curriculum design and literacy. Enrollees learn how to improve student performance. Students also learn how to effectively integrate technology into instruction. Students study theoretical and practical educational research and perform their own research. Students in a Master of Arts in Teaching degree program typically select a specialized subject in the education field. Some MAT degree programs require students complete a master's thesis. Online MAT degree programs typically include a student teaching experience. Everyone seeking their initial teaching license must gain student teaching experience and teachers who seek to gain additional certification in a different grade and/or subject must gain teaching experience. Student teaching typically spans between one and two semesters. How long does it take to obtain a Master of Arts in Teaching Degree or a Master in Education degree? The program lengths vary, general ranging from one and two years. A Doctorate in Education (Ed.D. ), a terminal degree, focuses on applying foundational knowledge and research to real-world leadership, organizational, education and other issues. Ed.D. programs prepare students for administrative, academic, professional, clinical or research positions in K-12 and higher education, public institutions, civil service, and private organizations. Instead of focusing on developing new research (such as with a Ph.D. program), Doctorate of Education students utilize existing research to inform decisions about specific issues which can lead to improving practices within their specialization areas. Doctorate in Education programs prepare students for leadership positions such as school district executives, training supervisors, chief learning officers in large corporations, faculty at the university level and more. Doctor in Education programs include specializations such as counseling, educational leadership, curriculum and instruction, postsecondary education, administration, special education and more. Ph.D. in Education programs prepare professionals to become education researchers, university faculty members, senior-level education leaders, policymakers, practitioners and scholars in an array of settings. Professionals with a Ph.D. in Education may have an impact on education research, practice and policy. Ph.D. in Education programs typically emphasize producing new knowledge in the education field. Ph.D. students can specialize in areas such as education policy and program evaluation, education leadership, literacy studies, higher education administration and policy, education, special education, society and culture, human development, learning and teaching, and more. Students in the Ph.D in Education programs improve their research and analytical skills. Salaries in the teaching profession depend upon three major factors: geography, educational level, and length of service. Teachers seeking employment in vital subjects such as math, science and special education or are willing to work in regions with teacher shortages may have it easier finding employment. The Bureau of Labor Statistics (BLS) forecasts an employment growth of six percent from 2014 to 2024 for high school teachers, about as fast as the average for all occupations. Many schools report having difficulty finding teachers for specific subjects such as math, science (especially chemistry and physics), special education and English as a second language. The BLS reports high school teachers likely have better job opportunities in urban and rural school districts than in suburban school districts. The BLS forecasts an employment growth of six percent for middle school teachers from 2014 to 2024, about as fast as the average for all occupations. The BLS reports middle school teachers likely have better job opportunities in urban and rural school districts than in suburban school districts. The BLS forecasts an employment growth of six percent from 2014 to 2024 for kindergarten and elementary school teachers, about as fast as the average for all occupations. The BLS forecasts better job opportunities in rural and urban school districts than in suburban school districts. Under this program, teachers who teach full-time for five complete and consecutive academic years in specific elementary and secondary schools and educational service agencies which serve low-income families and meet other qualifications may qualify for forgiveness of up to a combined total of $17,500 on their Direct Subsidized and Unsubsidized Loans as well as their Subsidized and Unsubsidized Federal Stafford Loans. If teachers have only PLUS loans, they are not eligible for this type of forgiveness. Teachers with a loan from the Federal Perkins Loan Program may qualify for loan cancellation for full-time teaching at a low-income school, or for teaching in specific subject areas. They can also qualify for deferment for these qualifying teaching services. Teachers should check with the school which made their Federal Perkins Loan for more information.